Marking the ‘Nabakalebara’ festival in Odisha, the state government recently got a legal nod from the Centre to set up a medical college named after Lord Jagannath. 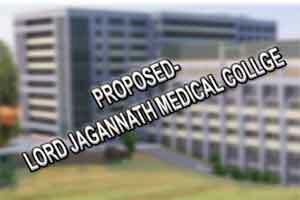 Appropriately titled as Shri Jagannath Medical College Hospital, the government has accepted a proposal of Shree Jagannath Temple Administration (SJTA) in this regard. This is indeed a festivity to be cheered on ‘Nabakalebara’ festival which is being celebrated after a gap of 19 years. Earlier on July 4, Chief Minister Naveen Patnaik had laid foundation stone of the proposed Lord Jagannath medical college hospital. The hospital is being set up at Puri under the Centrally-sponsored Pradhan Mantri Swasthya Surakshya Yojna. Under the scheme, the cost of establishment of each medical college is about Rs 189 crore of which the Centre will bear 75 per cent of the expenditure. The intake capacity of the medical college is 100. The State government will provide 20 acres of land free of cost. The scheme has provisions to upgrade the District Headquarter Hospitals having more than 200 beds to medical colleges.